The idea behind under seat subwoofers is exactly what you would think. They are designed to fit under your car seat to help save on space. You typical under seat subwoofer is not meant to create huge amounts of sound and pump out the strongest bass. It is meant to help add a little something extra to factory default sound systems. Because of their size, they will cost you less money to run, and their weight isn’t going to cause your gas bill to rocket. Usually, you should purchase an under seat subwoofer box, but these are also light and relatively small. What you should know is that the power capabilities of most underseat subwoofers are much less than larger contenders, as you will see below. Here are five candidates for the best underseat subwoofer currently available on the market and ready for you to install in your car. The best value for your money from one of the top brands. You can't go wrong with the 11HS8 from Kicker. 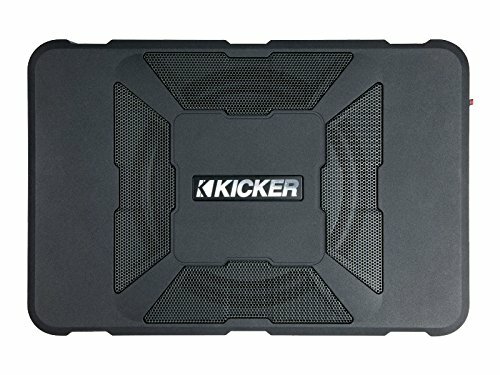 Kicker, as a brand, will keep popping up if you are looking to upgrade your car’s audio system. This is because Kicker is one of the better brands available out there. They are reliable and make sure to use good quality components. In this price range, the Kicker is more expensive than the alternatives, but it is still a good option. What I will say is that the Kicker is a little bigger than some of the other options, and comes with a 10-inch speaker, so fitting it in your car is going to be a little more difficult depending on the space you have available. Pioneer comes in a close second with an underseat subwoofer that is a bit on the plus size. But, if you can fit the 18"x13" into your ride, you won't go wrong. Pioneer are a well-known and established brand when it comes to in-car audio systems. The Pioneer TSSWX2502 is a good example of their ability for this class of speaker. Primarily, this subwoofer makes sure to use an oversized cone to ensure louder bass. If you are looking for stronger bass and reliability, the Pioneer is one of the best underseat subwoofers available. One issue with this model is that it’s a bit on the plus size. The typical underseat subwoofer box is designed to fit into cars with a lack of space. This product does not really catch onto that and with a width of over 18 inches and a depth of over 13, you are going to want to check if this speaker will fit before you buy it. A good choice if you want a decent underseat sub with a mid-market price tag. For Pyle, the PLBASS8 is pretty expensive. Pyle tends to sell the budget option when it comes to car sound systems. Surprisingly the PLBASS8 is actually more mid-market when it comes to underseat powered subwoofers. 300 watts of power make this on the higher end of the spectrum for this speaker class, and the decibel sensitivity of 93 dB also gives this speaker much stronger footing than some of the competition. A good choice if you want a decent underseat subwoofer. Lower capacity than others on our list, but worth checking out if you are in need of an upgrade at a good price. The Kenwood KSC-SW11 is a good option if you are looking at updating the sound system in your car. the KSC-SW11 is small and compact and does manage to get quite loud. What I will say is that the power capacity is one of the lower options in this class, at only 150 watts. However, the Kenwood designed aluminum enclosure will help to eliminate rattle as you use it, so you won’t be listening to sounds you didn’t pay for. Kenwood is a reliable brand for in-car audio. The Sound Storm LOPRO8 is great for its price. 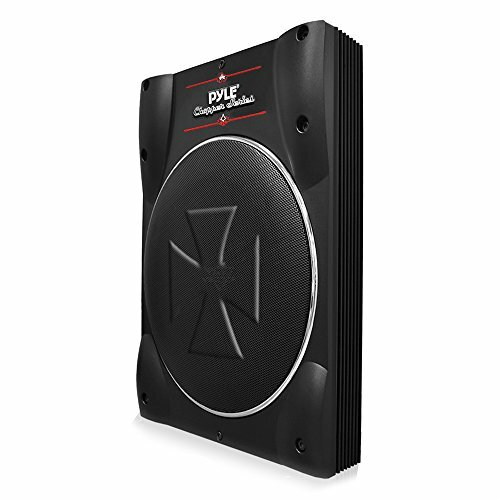 With this you can buy a speaker capable of pumping out 400 watts of power; more than the competition. The low price is because the Sound Storm LOPRO8 is relatively new to the in-car audio system market. Nevertheless, this unit focuses on ensuring that you are going to be able to fit it almost anywhere. It also comes with thermal, and short and overload protection circuits, meaning you won’t end up with a heavy paperweight is something happens. Buying an underseat powered subwoofer is a great way of fitting an extra speaker into your car. They are small and convenient and so are ideal for installing in compact and sport vehicles. As I said before, you are going to get a much lower wattage on these than on some of the larger options available. If you are looking for a smaller sized speaker (but not as small as these) and you still want a bit more power than an underseat subwoofer can offer you, you should look for a free air subwoofer.